Yesterday in my garden class, the speaker opened up his presentation with the statement, “the problem with plants is people!” I thought this was pretty clever and really not too far from the truth. We are always trying to diagnose a problem and one of the biggest challenges in gardening is figuring out how much water plants need. If you’re like me, you are so desperate to keep them alive, you water more than you should. 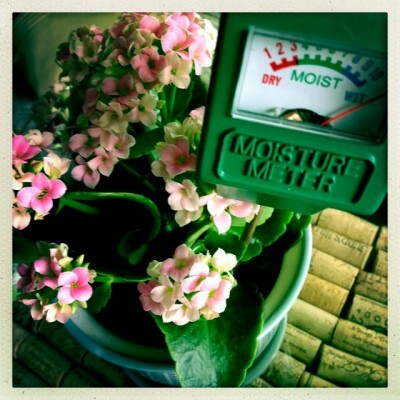 The reality is that over-watering is more often the cause of death to a plant than not. When I got my lemon tree, I took care to really review the instructions on how to water the plant. Lemon trees, like many plants, like moist soil but not wet. It was recommended to purchase a moisture meter, so I did. I ordered this moisture sensor meter from Amazon and my life with houseplants is forever changed. When I measured down by the roots, the meter showed that the soil was moist. Not dry, at all. 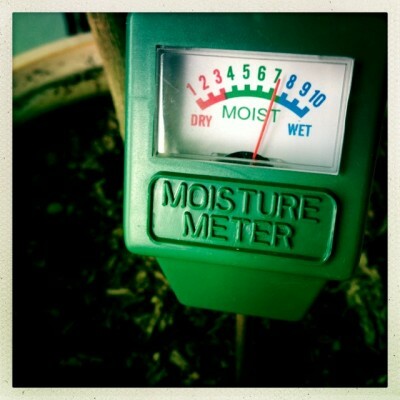 When I moved the meter even further down, it showed that the soil was actually leaning more towards wet. For curiosity’s sake, I measured the top part of the soil. Sure enough, super dry. This is where many of us go wrong; we touch the top of the soil and think that the plant is thirsty. I then proceeded to measure the other plants in my house, which all had been watered a few days earlier. I discovered that I committed the crime of serious over-watering! The plant above was way past wet. Another plant also measured past wet even though the leaves were drying out and curling up. While it seems counter-intuitive, this is actually a sign of being over-watered. Roots need air and if you saturate them with water, known as “wet feet”, they can’t transport nutrients up to the leaves and can end up with root rot. 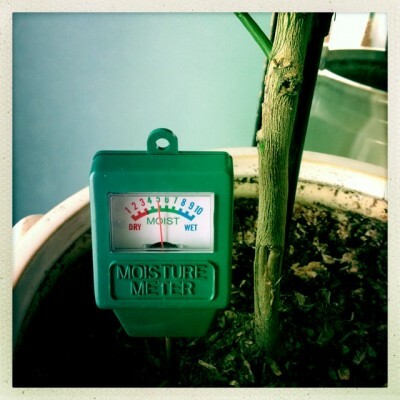 Moral of the story- a moisture meter is really quite helpful in determining whether your plants need watering. I ended up waiting until today to water my lemon tree and I’m guessing the other plants won’t need watering for about two weeks. This is what the guy meant by “the problem with plants is people.” Sometimes we need to just back off and let them do their thing! absolutely one of my worst problems with house plants. think i need one of those cool things!! What a fun tool – something I definitely need! And I’m laughing over the problem with plants being people. I learned a similar lesson recently when seeking help for feeding Graham, I was half the problem! Wow, there really is a gadget for everything! I killed a beautiful poinsettia plant last year because I wanted to be a really good plant mommy and give it water every day. And then when it began dying, I figured it probably just needed more. It was my mom who later told me my error. A good lesson to be learned here.